Are these bankers better than Wall St? Franco-Nevada and Royal Gold were both founded in the 1980’s. Wheaton Precious Metals (previously named Silver Wheaton) is the new entrant over the past ten years to join the club. When you look at the market cap of these three companies to the ten biggest companies on the S&P 500, they appear incredibly small. In the gold mining sector, you always hear about the stalwart names of Newmont Mining, Barrick Gold, Goldcorp, Newcrest Mining, Agnico Eagle Mines. Sometimes you will hear about the three kings: Franco-Nevada, Royal Gold, or Wheaton Precious Metals. 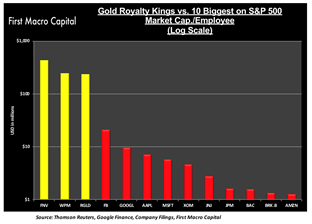 Yet, 3 of the top 10 gold-focused companies in the world are royalty and streaming companies. Much of the attention for investors is focused on the mining companies since they are the ones that develop and manage the mines to get the gold and other commodities out of the ground. The royalty and streaming companies are a critical piece in providing financing to explorers, developer, and producers to reaching their desired goals. Mines are some of the most capital-intensive operations in the world. They need ongoing capital to build their operations. Royalty and streaming companies help fill that void when bankers or capital markets aren’t interested during the commodity bust period. But when you look at the market capitalization per employee for these same companies, it starts to give you a different picture of how drastically different the business models of streaming & royalty companies are to mining companies and the biggest companies in the world. 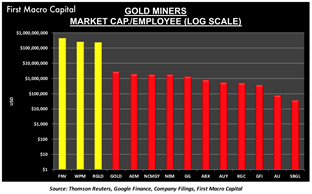 The Three Kings create millions of dollars in market cap per employee compared to the S&P 500 stalwarts and the largest gold miners. It is not even close. The real magic of the business is displayed, when you look at the revenue generated per employee. Most people when they think of this metric, think of companies like Apple, Google, and Facebook, with the addition of ExxonMobil back in the mix because of the rise in oil prices. These three royalty companies generate some of the highest revenue per employee in the world, and it is by a wide margin. You can really see how scalable these royalty companies are when you compare them to the tech giants of Google, Apple, Microsoft, and Facebook. The Three Kings can add more contracts in the form of royalties and streaming contracts, without having to add hundreds of new staff to their business. Whereas a gold miner, depending on the jurisdiction where the mine is operated, may have to add 100’s, even 1000’s of staff to start a new mine and keep it in production. 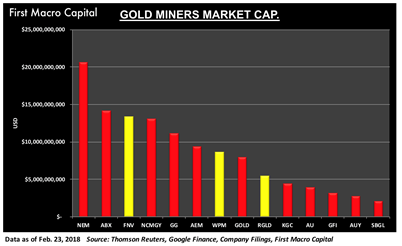 Both business models still have the optionality to the price of gold and the expansion of the resource at a mine. Royalty companies are long-term growth stories that growth & dividend investors seek out. Longer-term investors, like retirees or those managing a diversified industry portfolio, tend to prefer owning mining stocks with lower volatility and more consistency in the business. This results in royalty gold stocks being easier to manage in the portfolio. Lots of liquidity, so you can do algorithmic trading. The gold mining stocks tend to have a higher daily average-true range (ATR), because they are more sensitive to the price changes in gold or the main commodities the gold stock is exposed to. The ATR is the difference in the high and low price of the day from the previous days close. Basically, the ATR shows you the daily volatility of the share price from the open. The higher the daily volatility the more traders love trading in the stocks. When you look at the number of shares traded by Barrick Gold on the NYSE, Barrick average of 13.571 million shares, this is more than 16X the number of shares traded of Franco-Nevada at 0.594 million shares traded. This doesn’t tell us the whole picture . What matters more is the total value of shares traded each day. This gives investors a sense of the amount of money moving around between investors. Franco-Nevada trades about $46 million worth of shares each day, whereas Barrick Gold trades about $138 million every day, which Barrick Gold trades about 3X more than Franco-Nevada in dollar terms. How do these royalty kings make their money? These royalty companies earn their revenue in two primary ways, a royalty or a streaming contract. They obtain these by providing money to mining companies that need the capital for current mining operations or the development of a new mine, even for exploration of a property. In exchange for the money, the royalty & streaming company receives a simple “percentage of the value of the future production from the property, typically 1% to 5%. Often these are stated as a percentage of the net value the operating company receives for its concentrated product when it is processed at a smelter, hence the term “net smelter return royalty” or “NSR royalty” . In other words, they let the miner operate the mine, and they collect checks as a percentage of what is produced. There are two less common royalties that are based on the profits of a mine or a fixed-rate royalty. No additional capital is exchanged to maintain the royalty. Up front work for years of rewards. “Streams are metal purchase agreements that provide, in exchange for an upfront payment, the right to purchase all or a portion of the gold, silver or other products from a mine at a preset price.” The royalty & streaming company is required to make ongoing cash payments at the agreed upon price, which typically ranges from 60-80% below the spot price of the commodity when the contract is signed. The streams last for a specified number of years, where the royalty will last in perpetuity or until it gets bought out (if there is an option), or government seizes the claim. 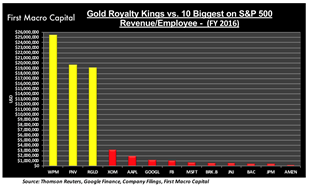 Do royalty stocks have Buffett style moats? Should the royalty & streamers add development staff? 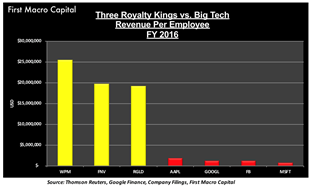 When you look at how similar the revenue per employee is between the Three Kings, yet the markets caps between the Three Kings are between $5 billion and $15 billion. Shareholders could start asking themselves when evaluating the royalty & streaming companies, “how many additional staff can these royalty companies continue to add to continue to grow revenue?” Since 2015, we have seen many new entrants into the royalty market during this time to seize on the opportunity that the Three Kings have left to these new entrants. Adding a couple of staff would allow them to capitalize on this opportunity and sign mid-tier transactions. 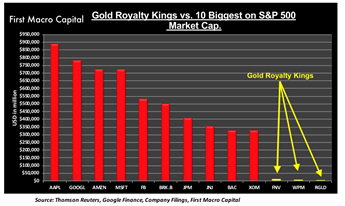 Yes, these companies are all tied to the price of gold, but revenue is a function of 1) Gold price and 2) Attributable gold equivalent ounces. If these companies assume they don’t know what the price of gold will be (which is a reasonable expectation), and only signing new royalty and streaming contracts is in their control. The value of adding a new employee could add 100’s of millions in market cap, particularly on the corporate development side. This would add significant value to these businesses and to shareholders over the long-term. Finding the right mix of headcount is no easy task. Maybe, instead of adding more staff they will buyout smaller royalty companies instead of creating new royalties and adding more staff. Franco-Nevada and Royal Gold have a history of acquiring companies from past cycles. Will Wheaton Precious Metals take the plunge? We can see this new cycle being not much different to past and M&A will occur. Blow-ups are less likely to occur for mining royalty stocks because they have a portfolio of revenue streams coming into the business. Banks tend to reduce lending when the commodity prices fall, thus allowing the royalty and streaming companies to obtain new royalties and streams with less competition. Capital markets reduce access to new equity capital when commodity prices fall, typically resulting in lower mining stock prices, and investors fleeing the sector. They have optionality to commodity prices increases, across the majority of its royalties and streams, allowing them to boost revenues without doing anything. These three royalty stocks (FNV, RGLD, WPM) are consistent dividend paying stocks. Optionality to the expansion of a resource, that a royalty has a claim on, but may not generate revenue until the mine expands its operations onto the claim. As new streams and royalties are added, it provides a moat of ring around the business that makes the business stronger and stronger. As more royalties turn into cash flowing royalties, it reduces the percentage any one royalty or stream has on the business. There has been a number of new entrants since 2015, and consolidation is inevitable with any industry. It will be easier to acquire than do new royalties because the new royalty and streaming returns will be reduced because of new competition. Higher commodity prices give miners confidence they can raise their capital through equity and/or debt than through a royalty. First Macro Capital writers and publications do not take compensation in any form for covering those securities or commodities. 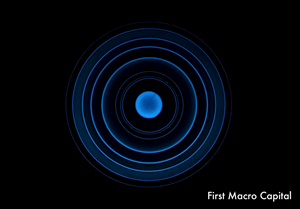 First Macro Capital employees and agents of First Macro Capital and its affiliated companies own some of the stocks mentioned in this article, prior to the writing of this article.